At the High School for Community Research & Learning over 100 protesters, mostly students, loudly voiced their anger at the Department of Education’s (DOE) notice to close them down. Students filed out in front of their Stevenson Building in the bitter cold with hand-made signs, some which read, “SCRL did not fail, the DOE failed us”, “Phase-out is not a solution” and “Money for War, Money for Stadiums But No Money for Education”. 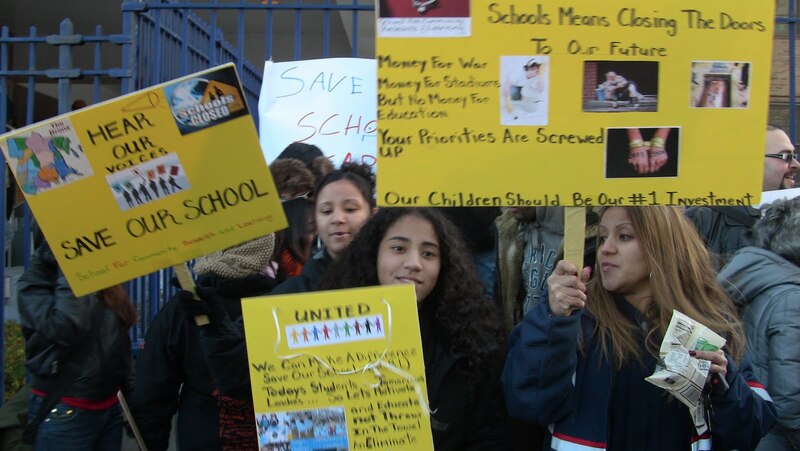 As this energetic crowd picketed up and down the sidewalk, they chanted loudly “Save Our School” and vowed to raise outrage at their DOE “hearing” on Jan. 5 at SCRL High. Click on title for video. What I want to know is if the reason for closing schools and cutting back is money than where is all the money that has been generated from the New York State Lottery. Years ago, the politicans pushed for lottery and said it would “help” fund our Public Schools. That is how they got people to move forward with it. Where is that money and which public schools are receiving these funds? Certainly, not New York City Public Schools!